So many wildflowers...so little battery life on my camera and phone (also a camera). Maria and I exhausted the batteries on both cameras taking over two hundred photos during a brief hike through the Nan Weston Nature Preserve at Sharon Hollow on a mid May Sunday afternoon. The Nature Conservancy established and helps to protect the Preserve, and what a place it is! A short hike through the preserve is like taking a walk back to what the Michigan landscape used to be. Following are a handful of my favorite photos and species of the day. This photo is of potential. Showing one of numerous Wild Gooseberry shrubs in the woods of Nan Weston Preserve. I would certainly like to visit when the uncountable gooseberries ripen and carefully steal a few sweet tastes from the prickly treasures. 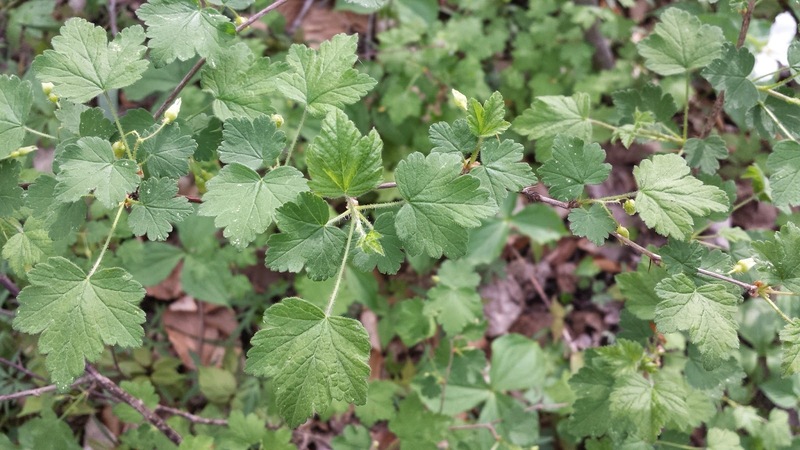 According to Gleason's Plants of Michigan, there are eight species in the Ribes genus in Michigan. Keying this particular shrub, my best guess is this is Ribes cynosbati in the Grossulariaceae family due mostly to the location in deciduous woods. 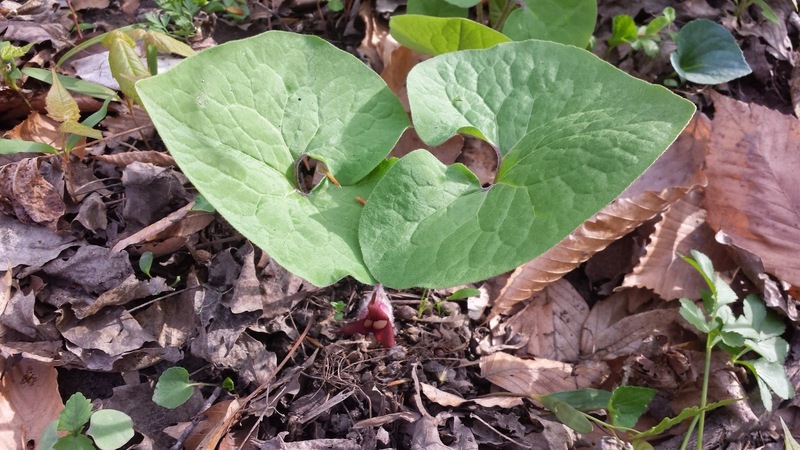 My favorite groundcover, Asarum canadense, in the Aristolochiaceae family, was found over much of the Preserve. This photo shows all of both leaves and the flower below. If you do not specifically look for the flowers in May, they are easily missed. 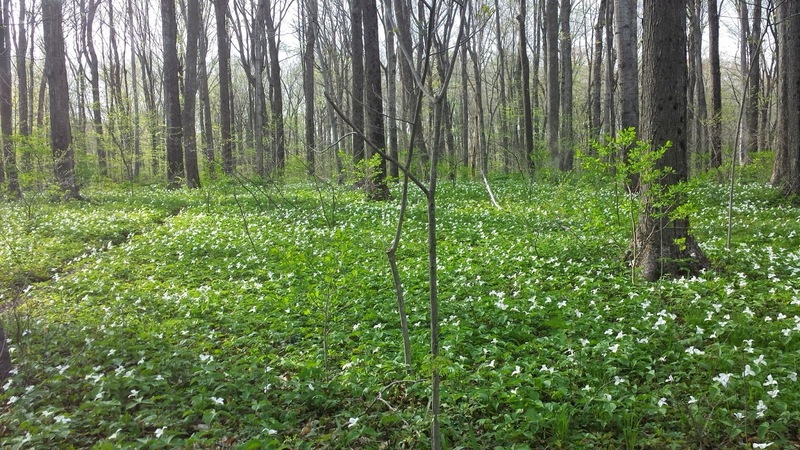 I included this photo to give you a sense of the uncountable wildflowers covering the forest floor. Keep in mind that this photo is only in one direction. A panoramic view of all the wildflowers might be too much for your computer! This photo shows two buddies for the season. On the left, Trillium grandiflorum, in the Lilliaceae family. On the right is Hydrastis canadensis in the Ranunculaceae family. 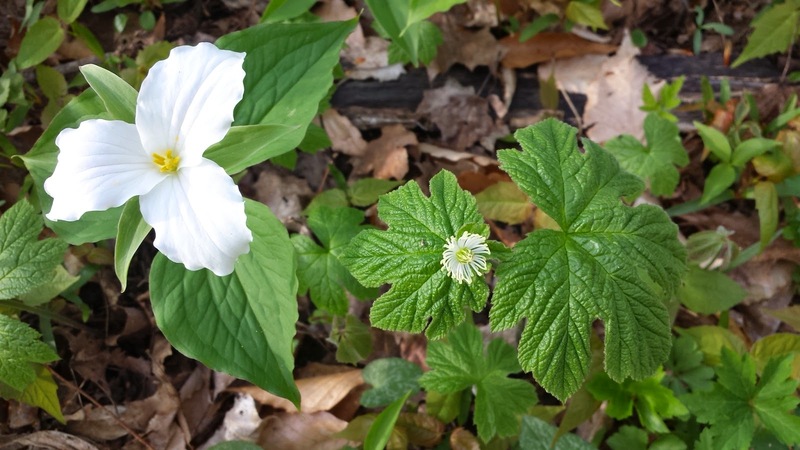 The Common Trillium carpeted the landscape, while the Goldenseal is more subtle beauty (and also rarer). 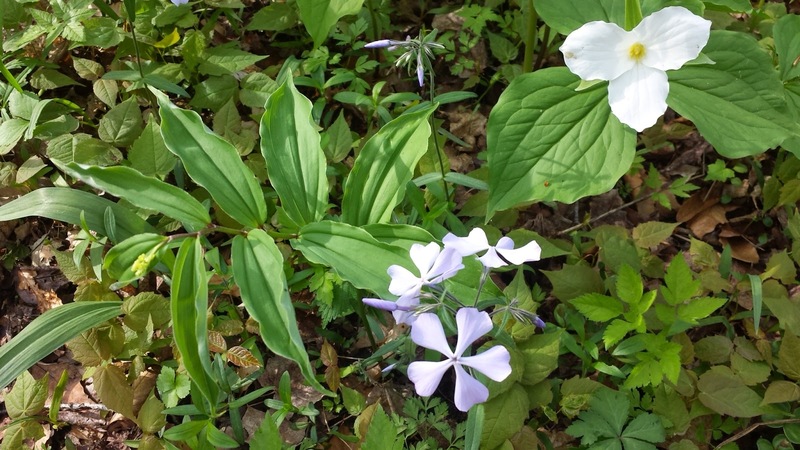 Another combination photo showing Maianthemum racemosum or False Solomon's Seal in the Asparagaceae family (on the left), Phlox divaricata or Wild Blue Phlox in the Polemoniaceae family (middle low), and Common Trillium (top right). Let's just say there were many opportunities for combination photos. 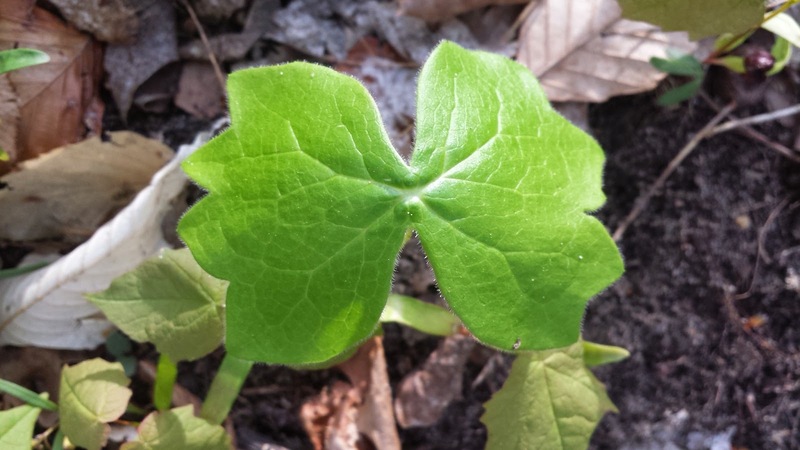 A photo, of hope and newness, the small, young leaf of Podophyllum peltatum in the Berbidericeae family. Of the many photos we took of this relatively common species, this is the one I decided to share. Though violets are considered to be a weed by some, the blue, the white and this Yellow Violet, Viola pubescens in the Violaceae family, seemed to fit right into the amazing landscape. The beautiful flower of Panax quinquefolius of the Araliaceae family, also otherwise known as Ginseng. This panicle flower should turn into a panicle of red drupes some day. Here was the super small, subtle flowers of Bishop's Cap, Mitella diphylla in the Saxifragaceae family. Lastly, know that these brief words and pictures fall very short of fully describing the beauty and peacefulness of the Preserve. I discluded several startling photos simply because I lacked confident identifications! Please visit the place yourself and feel free to share the experience with me.